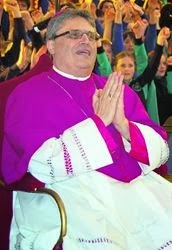 Go HERE to read about the late Bishop Joe Grech, an anointed servant of the Lord. This is a homily he preached on the First Sunday of Advent in 2006 (from the website of the Diocese of Sandhurst). A little story helps us to understand what it means to wake up. A well renowned Rabbi once asked his students “How can you tell that the darkness of the night has passed and the light of day is once again with us?” One student said that this happens when you see an animal in the distance and you can tell whether it is a dog or a sheep. Another student said that the day starts when you can tell whether a tree is a pear tree or an apple tree. Many students kept giving different examples but the Rabbi remained unimpressed. The students pressed the Rabbi to give them an answer. And he replied in this manner. “It is when you look at the face of any human being and you recognize in that face your own brother and sister because if you cannot do that, then no matter what time it is, for you it is still night”. This happens so often to us. We might think that we are living our lives exercising our full potential. However, at times when we give ourselves time to think and reflect we realize that we can do things a bit differently and the results would be better. In doing so, we become more and more powerful witnesses of hope and blessings to those who we encounter. This is precisely what happened to Archbishop Oscar Romero of El Salvador. He was always a good person. He tried his best in order to nourish his people spiritually and to help them develop a close relationship with our God. He was a man of prayer and was also a very good shepherd to his people. He lived his life in the best way that he thought that it should be lived. However, one day something happened that deepened his understanding of his ministry as a bishop. A close friend of his, a Jesuit priest Fr Rutilio Grande was driving to a distant parish with another person and a young boy. Half way through their journey, they were stopped by some soldiers at a road block and were shot in cold blood. When Archbishop Romero heard this, he immediately left to visit the place where this took place. The sight of the murdered body of his close friend and of the other two shattered him and he tried to understand the reason behind what had occurred. This friend of his had often criticized the government which was made up of military men for not taking proper care of the ordinary poor people who made up the majority of the population in El Salvador. As one might expect, some people in the government did not relish such an attitude and this is the reason why it was decided to eliminate him. Archbishop Romero, fully realized what had occurred and he decided to continue the work that his friend was involved in. He became the voice of all these people who could not make their needs heard. He became the cry of many people who lacked the basic necessities in life. His masses at the Cathedral became the opportunity for many of his countrymen to come together in order to try to understand and learn how to keep on living in the midst of so much hurt, injustice, anxiety and fear. He became a powerful constant reminder to those responsible and to ensure the dignity of each person as created by God. There was a price to pay for all this. The government started to send spies in the congregation in order to take note of what he was saying. He was harassed by the ruling section of the nation. He was gossiped about and he was put under great pressures in order to change the way that he was exercising his ministry as an Archbishop. And he also paid the ultimate price. One day he was celebrating Mass at a local hospital. At the moment of consecration when he lifted Jesus Christ high so that the people would remember that our God will never abandon us he was shot through the heart and murdered. This happened on March 24, 1980. Days before his murder Archbishop Romero said these words to a reporter, “You can tell the people that if they succeed in killing me, that I forgive and bless those who do it. Hopefully, they will realize they are wasting their time. A bishop will die, but the church of God, which is the people, will never perish”. My friends, let us wake up and stay awake. We are all called to continue this mission of Jesus Christ. Today we are the hands, the face, the feet and the heart of our God. We have been entrusted with such a powerful mission to proclaim that our God is not dead. Our God is alive and doing well. Let us realize that we have this God alive in our hearts and that we are invited to touch others with His love and with His presence. There are so many people living around us, who need their hopes renewed, who need encouragement to keep moving forward and who need to understand the purpose of their living. Only God can satisfy all our deepest desires and dreams. You and I have been entrusted to walk with these people and to take every opportunity to sow the seed of the word and the love of our God in their lives. Let us pray together.